Throughout her lengthy career in music, Beth Nielsen Chapman has garnered enough respect, credibility among her peers and lavish praise to be allowed a little self-indulgence. However when the result is as exquisite as UNCOVERED, the latest addition to her back catalogue, then the pleasure has well and duly been planted within the minds of the listener. On the back of a Grammy nomination for her most recent album, a collection of children’s songs titled MIGHTY RED SKY, Beth has re-visited a selection of sculptured tracks that she had either a partial or complete control of their composition but for a variety of reasons never got round to recording herself. Not that the songs were left in a cupboard, as seven of them earned number one status and were chosen by a very high calibre of artists from both the country world and those of a contemporary adult persuasion. The line-up of musicians that Beth enlisted the services of reflects her standing on both sides of the Atlantic ranging from the adept talent of Vince Gill to the Celtic virtuosity of Phil Cunningham. From a record that included recording locations of Scotland, Wales and Nashville Tennessee Beth has mixed and matched the production duties to capture an accomplished sound that weaves a thread through strains of traditional and popular country as well as a sprinkling of classical folk and easy listening ambience. Overall the result is a collection of skilfully produced and well-crafted tunes from an adroit song writer displaying the peak of her talents. From a personal viewpoint the most recognisable track was ‘This Kiss’ which Faith Hill took to the summit of the country charts around a dozen or so years ago and the line of the song ‘it’s subliminal’ goes a long way to describing Beth’s version as well. However this recording of the massive hit had to make way for another country number one as the album’s stand out track which belongs to the luscious and palatable tones of ‘Five Minutes’, a country classic taken to the ultimate heights by Lorrie Morgan. Lorrie and Pam Tillis joined Beth on vocals for this re-recording that gave a pertinent reminder of how to write a wide reaching country chart topper. This track which shares its title with a song from Gretchen Peters latest record leads us neatly into ‘Almost Home’ where the Wine Women and Song trio of Suzy Boggus, Matraca Berg and Gretchen provide gospel-eque backing vocals on a song made famous by Mary Chapin Carpenter on her PARTY DOLL AND OTHER FAVOURITES album. The name dropping of artists who have either recorded Beth’s songs or collaborated on this album has only really just begun. The core of this album sees another pair of successful country rollers take their place with ‘Nothing I Can Do About It Now’, taken to the top by Willie Nelson and ‘Strong Enough to Bend’ getting the same treatment from Tanya Tucker. Beth’s versions are no pale imitations and you are left to ponder why her own recording career fell short of such heights in terms of chart success. The mutual love of Beth from our side of the pond is reflected in the beautiful folk infused ‘Pray’ where the Celtic influence of its producer and Transatlantic Sessions stalwart Phil Cunningham laces a gorgeous track with scenery inducing whistles. Further UK input into the album came in the form of its title being suggested by keen Beth Nielsen Chapman advocate Bob Harris. This album should also provide a centre piece for the UK shows Beth has planned for February. The pick of the rest probably lies with the Vince Gill duet on Alabama’s number one ‘Here We Are’ closely followed by the Duane Eddy guitar contribution to ‘Sweet Love Shine’. Spritely album opener ‘Simple Things’ showcases Beth at her best in how to write a pure and catchy pop record while her versatility surfaces in the bluesy ‘Meet Me Halfway’ previously recorded by Bonnie Raitt. Of the final two tracks, ‘One in a Million’, a minor hit for the late Mindy McCready has a pleasing chorus while Darrell Scott lends a hand on ‘Maybe That’s All It Takes’ which was a low reaching chart entry for Don Williams. 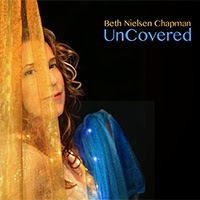 All the name dropping can seem a touch exhausting but the bottom line is that UNCOVERED perfectly encapsulates Beth Nielsen Chapman as a first class song writer and no less a fine performer. There is no better way to start the year off than a little indulgence yourself and give this album the opportunity to set the standard for the twelve months ahead.